Telenor Satellite Broadcasting fibre video production. 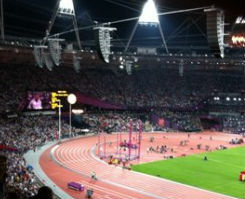 The MSNW terrestrial video fibre network of Telenor Satellite Broadcasting (TSBc) played a major part in the delivery of TV2 Denmark’s broadcast solution for its coverage of the London Olympic Games. TSBc was approached by TV2 Denmark to extend our multiservice network between the broadcaster’s production facilities in Odense (Denmark) and its temporary broadcast studio in London. A redundant and highly resilient end-to-end fibre connection was required so that TV2 Denmark could provide two-way live broadcast feeds, 24/7, between London and Odense. The connection was also required for broadband connections for the broadcaster’s journalists. The solution complemented TSBc’s well-extended and interconnected fibre network between London and Copenhagen, and was set up just in time for use at the start of the Olympics. As part of the solution, TSBc also provided satellite back-up to ensure continuous and seamless coverage. The technology worked flawlessly throughout the Olympics and ensured the delivery to TV2 Denmark of some fantastic coverage, capturing every crucial moment of this momentous event.